I'm not really sure where to put this post; this isn't a religion blog, after all, it's a politics-ish blog. But I read a lot of religion blogs, too, and this particular post and the responses to it made me think, so I hope you all will excuse this diversion from your usually scheduled programming for some religion thoughts. It is very true that there are tons of great people in this world who aren't Christians, but the problem with that is this, the Bible says that no man will enter the kingdom of God based upon how good they are and their good works, only upon receiving Christ in their hearts as Lord and Savior, ... True forgiveness comes from the Lord, something no man will ever fully understand. God does love all of us regardless of faults or things we deal with daily, but not all of us are His children. Millions of people believe in God, but nobody seems to understand what it means to follow Him. The joy and peace that is indescribable when you decide it's not your will anymore but His. I'm sure this person was well-meaning, but don't they realize how arrogant they sound? (Ironic, since much of Christianity emphasizes humility, but I digress...) I mean, at least they're willing to admit non-Christians can be good people, which some very religious people don't seem to believe, but assuming you know anything about someone else's personal spiritual experience strikes me as really condescending and rude. Religious experiences can be really powerful, but they're not unique to any one religion; a Catholic nun's brain while she's praying is doing the same thing as a Buddhist monk's brain while meditating, and I assume a non-theist having a "spiritual" experience, even if he or she didn't call it that, would probably have a similar reaction. One is not inherently more meaningful than another, regardless of what meaning a particular scripture assigns to it. The idea that only "God's children" can know profound joy or forgiveness is really troublesome, particularly because it elevates one group of people over everyone else based on a very arbitrary and deeply personal factor. But, on the other hand, I totally expected to find a comment like that before I even finished the poem, so it's not like that sentiment is surprising. Sigh. 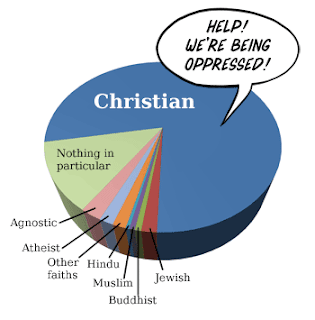 Dear members of the majority religion: You can't pretend to be oppressed AND impose your definition of a valid spiritual experience on the rest of us! Just sayin'. I am not a Christian either, but I was wondering if you had chosen a religion or not. Lain: I'm Unitarian Universalist, which is awesome as a community and basic moral code, not so specific on theology... I'm still figuring that part out. I'm not sure religion is something you choose so much as something you work out as you go along, though.. at least that's how I see it!